Deborah Lippmann has teamed up with Juicy Couture for the Holidays! These sets are available for pre-order here, and each set of three retails for $48.00. The are simply called the Gold or Pink set. I especially love the look of the Gold set, and the bottle caps look like they have a large rhinestone in them. The gold flakie in the center would be my first choice, but I don't think I'll spring for the whole set just to have it. They are pretty to look at though, don't you agree? I don't think these shades are repromotes, but I could be wrong. Some shades are repromotes in the set. Precious Metals ($48): » Here Comes the Queen: A Juicy Couture and Deborah Lippmann shade exclusive, this sheer glaze is infused with ultra-glam gold. Arrive in style by wearing it alone or on top of your favorite shade. » Jewel in the Crown: A Juicy Couture and Deborah Lippmann shade exclusive, shimmering pewter is perfect for adding a glow to fingers or toes. » Believe: A glimmering gold beige created with Cher. I have all but the first 2 in the metals set. I'll wait to see if they come out individually. I agree initially I am drawn to the gold collection. However I have seen swatches of the set with the red - only saw the white glitter and the red foiled metallic. The white one looks a lot like DL Up In The Air only no blue base but a milky base to it. Both it and the red are really beautiful. Pretty but I will skip these. 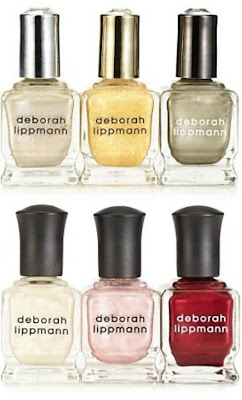 I ordered a set of Deborah Lippmann polishes from HSN. I've always wanted Just Walk Away Renee. It was 5 bottles for $49. HSN has lots of polishes but wish they were a lower price. I am a fan of both JC and DL so I am totally drooling over these! These are pretty but I am going to have to pass too. The price is a huge turn off and the colors look like stuff she has before!